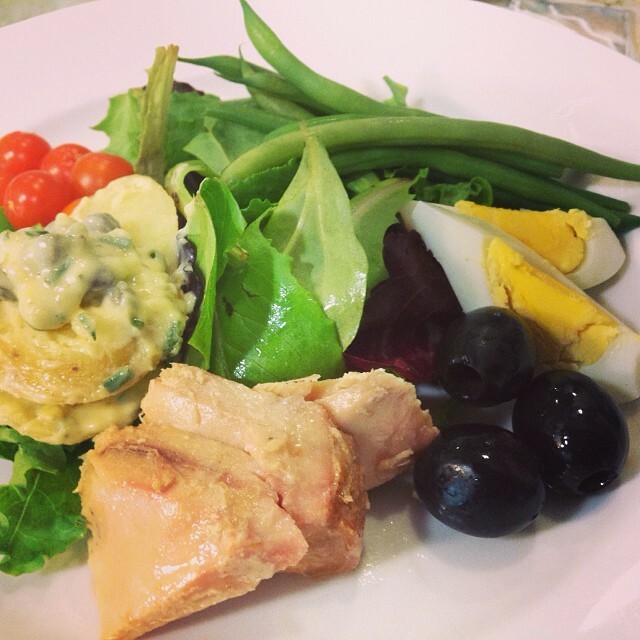 A Niçoise salad is a composed salad made up of tuna, potatoes, green beans (I prefer haricots verts or skinny French beans), tomatoes, hard boiled egg, and olives, usually atop a handful of lettuce, and dressed with a vinaigrette. This is a beautiful and versatile salad that has many health benefits. Being rich in protein from the tuna and egg. The tuna is also packed with omega-3. Being so excited to receive a case of the best tuna ever is actually what inspired this midday nosh. I have the good fortune to be friends with a lovely lady that is a self-proclaimed slayer of fish and part of a family of fisherman that practice sustainable fishing. 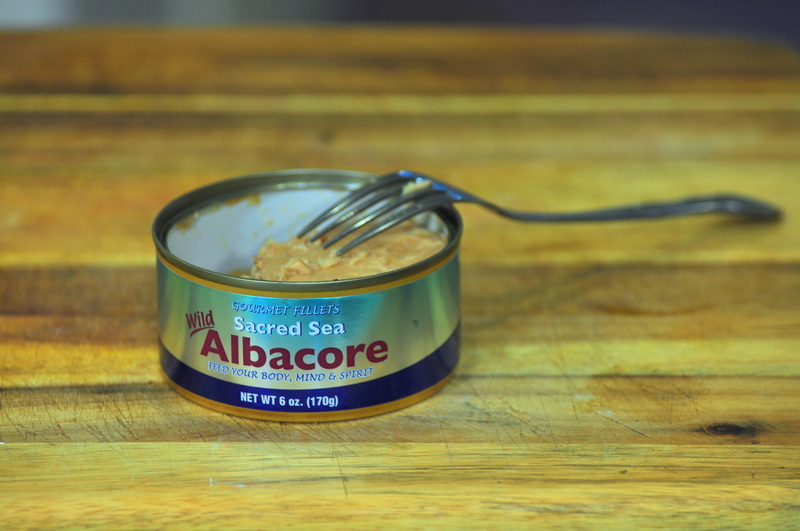 This tuna is so delicious, I can’t help but eat it straight from the can. Live update: writing this post made me need to go open up another can. Ok, that’s it on my rant of how irresistible this tuna is. 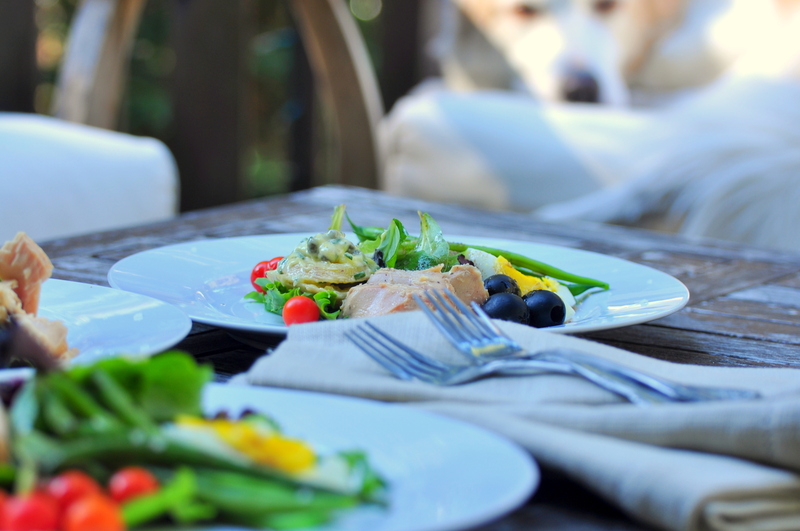 For your salad Niçoise, use however much of each ingredient you would like. Use whatever tomatoes or olives you have on hand or what sounds the tastiest to you. Although typically served with boiled and sliced potatoes, I had a little bit of leftover German potato salad so that is what I used. Click here for a quick instruction on how to make any easy vinaigrette. Enjoy not only how great it is to eat outstanding food, but the fact that you feel healthy eating this. I can never hard boil eggs correctly. How do you get them to looks so perfect? Place the eggs in a pan, cover with cold water, then bring that water to a boil. Once your water reaches a boil, immediately turn off the burner, but leave your pan on the burner for 10-15 minutes. Rinse with cold water right away. Peel and enjoy! My burners run very hot and tend to stay hot for a long time after turning off, and I like my eggs to be medium-hard boiled, so I prefer to leave them on the stove for 8-12 minutes. This way you don’t end up with that pesky grayish green layer between the yolk and white.